Before 1956, there was no such thing as videotape. That was when Ampex developed the first practical videotape recorder (see photo at right). Before that, television was recorded by focusing a movie camera lens on a TV picture tube displaying a live television program. Then the film had to be developed before it could be shown! Between 1956 and the mid 2000s, videotape was the way we recorded video, first on reels, then in cassettes. Now, it's possible to record video digitally, so the images and sound are saved as a data file, either on a small card or built into the camera. When people ask me to film something or tape something, I often correct them by saying, "You want me to make a video recording, right?" That's because "making a video recording" doesn't limit me to any particular recording medium. But I didn't include this page on my web site just for the sake of history or semantics! There is a practical reason. When video was recorded on cassettes, I could just take the finished tape out of the recorder or camcorder and hand it to you, pack up my equipment, and go home. ﻿This is a photo of the first practical videotape recorder, the Ampex VR-1000. The prototypes of this machine were first demonstrated for customers in 1956. The reels of tape were placed on spindles on top of the console at the right. The machine included the two racks of electronics on the left. Although the transistor had already been invented in 1948, all the electronics in the VR-1000 were based on vacuum tube technology. What you see here cost $45,000 (in 1956 dollars, equivalent to about $415,000 in 2018!). Once a recording has been made, I take the camera back to my studio and upload the digital video files into it. Then, I could just send you the files, but as video files are too large to send as Email attachments, you and I have to decide how I'm going to get them to you. So, whenever I shoot a video, I have to spend at least some time in my studio, uploading and then sending the files to you. * That means there should be at least something in your budget to cover some studio time for me to do this, in addition to any time I spend making the recording in the first place. If I'm going to do some editing, such as selecting certain scenes, adding titles, music, still images, and so on, then that's another step in the process. When all the editing is done, I 'render' the file out of the editing software after which I can send it to you or post online on your behalf. Here is a photo of me from a few years ago, directing a shot, while using my HD camera, the Sony HXR-NX5U. It records the video and sound on 2 solid state SD memory cards. 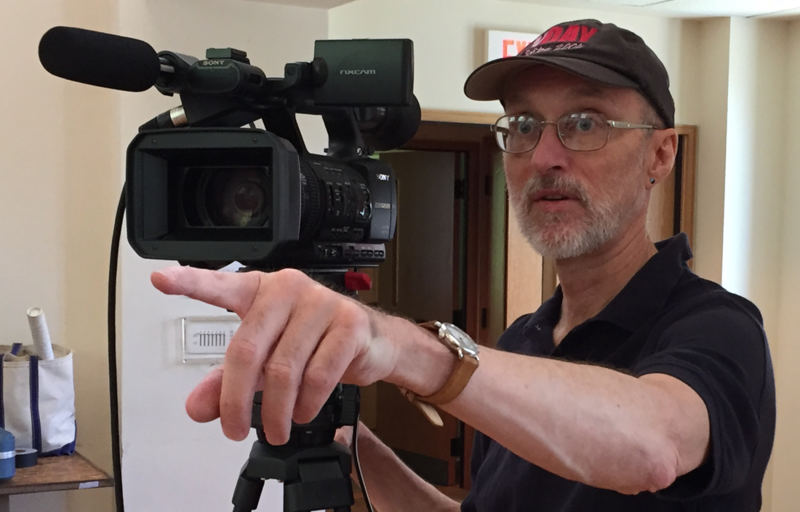 Photo during a tech rehearsal, on location in Belmont, Mass., June 2015. Note: If you want to digitize recordings you already have on tape (video or audio), please click here to see my "Video Restoration" page.